2018 Spring outdoor design ideas can elevate your mood and outdoor space this season. It might not feel like Summer (yet) though the warm weather is quickly approaching, and we couldn’t be more excited to spend Summer evenings on the patio with a glass of our favorite beverage, sitting beside the fire and enjoying memorable moments with friends. The Summer months also bring plenty of outdoor design opportunities through decorative additions that can make a big difference as the seasons change. It’s one of our most favorite times of the year! Winter in Boston can be brutal for the outdoors. Snow, sleet and freezing temperatures can do a number on our outdoor patios and gardens. We’ve grown accustomed to the Spring and Summer clean-up, though the Summer months are truly all about the outdoor spaces. First things first, spend time in the next couple of weeks focusing on such spaces. Prepare the foundation for what is to come. Whether it’s pressure washing your deck, removing less-than-impressive plants in the gardens or clearing out older patio furniture, outdoor spaces will be your focus in the coming months. 2. All hail the fire pits! A beautiful patio fire pit can do wonders when it comes to outdoor design. You’ll be amazed at how much time will be spent around the fire as the sun fades away, and your guests wrap themselves in blankets around this focal point of your deck. Fire pits can be found online or in nearly any outdoor furniture or goods store. They have certainly made a come back in the market over the last few years. In step one we advised that you prepare the foundation for what is to come – that is, clean your outdoor space and lay fresh ground. Now is the time to revive your garden and planters with fresh patio plants and florals that can withstand the warmth in the Summer, yet hold strong in the Winter. Boxwood hedges are beautiful additions to a patio, as are Calla Lilies. Select the best patio planter for your lifestyle, and have some fun at a local farmer’s market or nursery to find exactly what you want! 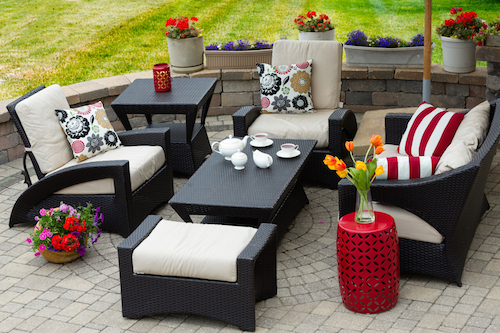 Outdoor furniture can be so much fun to shop for. Not only do incredible, local companies make some impressive outdoor furniture options, such furniture can also add so much life to your outdoor space. Personally, we love large furniture that takes into account enough space for parties and socializing around the outdoor firepits. Be sure to take into account the space needed outdoors for guests and family alike. Being outdoors in the Summer, late into the evening, means that you can’t forget the lighting. 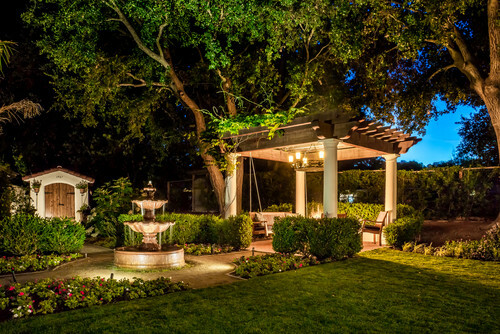 There are plenty of outdoor lighting options that will add character to your space, such as patios with strings upon strings of unique lighting. 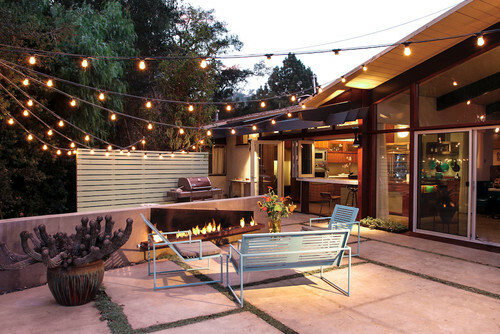 We love the addition of string lighting to a backyard patio, as it adds an urban twist to any space. 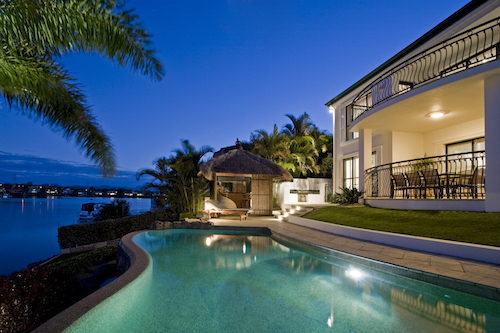 Uplighting can also be used strategically with flat spaces, such as uplighting on your outdoor fence. Visualize your space and use lighting in a thoughtful, unique way to truly impress. Start off your Summer with some 2018 Spring outdoor design ideas. It’s what we love to do here at MDK Designs. It’s a time of the year when the days are longer, the evenings are extended and fresh air is plenty. Consider taking a risk this Summer and explore an area of your patio, backyard or outdoor space that you might not have ventured into before. Some new 2018 Spring outdoor design ideas may help you enjoy the entire summer season. Contact Melanie Kokoros at MDK Design Associates to discuss some ideas for your outdoor space this Spring.